TPC Overall Rank: #135 out of 2933 rides. In User Top 10: 46 times. User Tracker Count: 156 times. 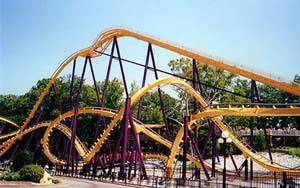 The Georgia Scorcher is a steel stand up roller coaster. It was built by B&amp;M in 1999. It is 107' tall, 3,000' long. It is fast, fun, rerideable, it has a large capacity, and a long duration. Good ride, and 100% better than the B&M stand up at the semi-nearby Carowinds……I thought for a minute this was better than Chang, but after I rode, I think I prefer Chang&#39.s wind-rush feeling and longer layout to this. GA Scorcher has its bit of intensity, speed, and pacing too, but I guess to a lesser extent than the Kentucky monster. There was a bit of noticeable headbanging (from the back seat), but nowhere near the level of headbanging that Carowinds&#39. Vortex provides. This is currently my second favorite stand-up behind Chang, but it is just not as good as traditional sit-down airtime style coasters in my mind. This is easily the best stand-up Ive been on. The drop is great and gave some thrilling air and the vertical loop had great Gs. The entire ride was smooth and the helixes had really strong Gs as well. I was able to get two rides on this one when I went last Sunday and the first one was great, but the second one was memorable for a bad reason. I felt the drop and the loop a little more on the second run (I rode in the back both times) but after the loop my right calf started cramping really bad from the pressure of standing up. Thats all I could think about the rest of the ride, so it wasnt very enjoyable after the loop. This coaster probably would get an 8 from me if my leg wouldnt have cramped up. This ride is great! It might be short, but is very thrilling. This is my favorite stand-up coaster! It provides smooth turns, inversions, and drops. The ride moves fairly quick, which is suprising for Six Flags. 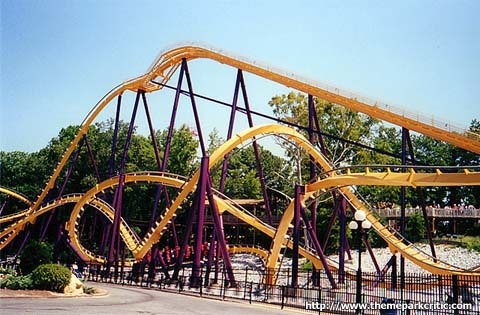 Its a good stand-up coaster, but I think Mantis beats this hands down. GS only has two inversions. This is 1 awesome roller coaster. Its more awesome than Shock Wave at PKD. You just got to ride the Scorcher. I think that this ride was a blast. It was actually one of the more comfortable rides that I have ever ridden. The inversions were great, especially the first time. The second and third times, the ride seemed to go by faster than before, and I think it needed one more thing right at the end. I absolutely love this ride! Its not very tall, but with a ride like this, height is not an issue. The best part of the ride to me, is the turn right before the corkscrew. Those turns jerk you, but in a good way. I see people sitting down when youre supposed to stand up, DO NOT sit down, if you want the best ride, STAND UP! Best ride in the park in my opinion. This was my first stand-up coaster, and it has become one of my favorite coasters in the park. The loop is executed perfectly, in my opinion. The train seems to glide gracefully through it, not too fast and not too slow. 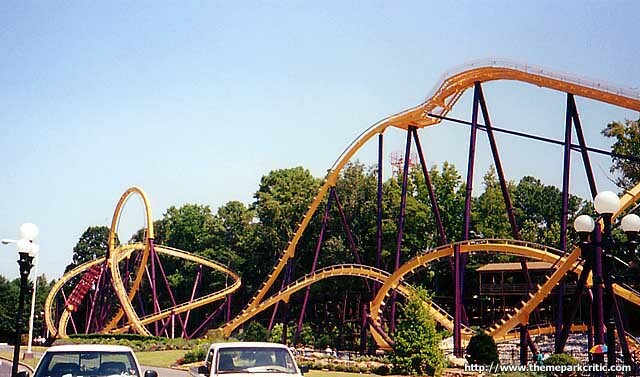 The fact that youre standing up makes the high-banked turns and the corkscrew more exciting, too. There are several moments when the restraint is the only thing keeping you from falling down to the rocks below. Overall, this is one of the better coasters in the park, in my opinion, and should not be missed.